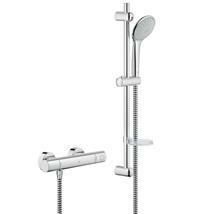 The GROHE Grohtherm 1000 Thermostatic Exposed Valve (EV) 1/2'' Shower Mixer Kit 34154 000 is a dual controlled wall mounted thermostatic bar shower mixer, complete with shower rail with adjustable height slide bar, 3-spray showerhead with rub-clean nozzles and 1.50m metal hose; designed for exposed/wall mounted installations in high pressure systems, in GROHE StarLight® chrome finish. 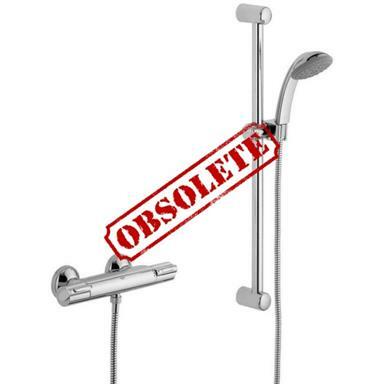 - Wall Unions, 1 pair, for exposed water supplies (MPN 18862 000). The Grohtherm 1000 Thermostatic Shower Mixer provides a thermostatically controlled shower experience and all the associated benefits, at a great price. 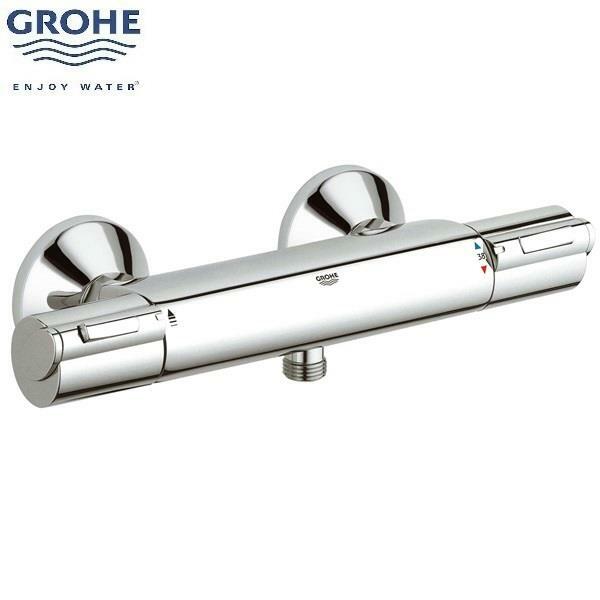 Finished in sparkling GROHE StarLight® chrome that is resistant to scratches and tarnishing, and using GROHE TurboStat® technology, Grohtherm 1000 guarantees luxurious showering at a constant temperature, regardless of any changes in the water supply. 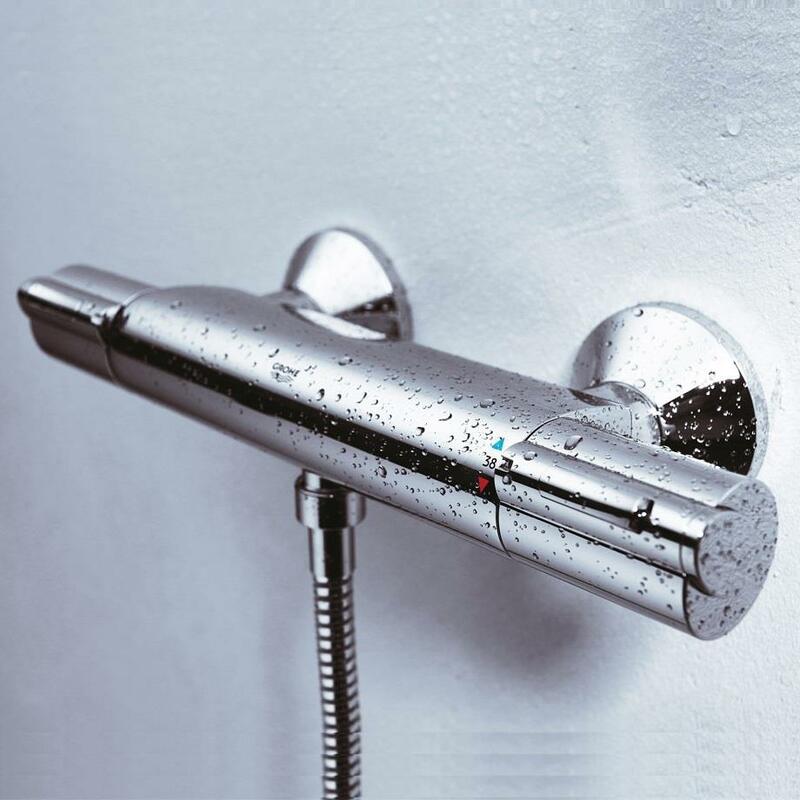 The Grohtherm 1000 shower kit makes temperature selection an intuitive and easy process thanks to the EasyLogic scale ring, while the SafeStop button, set at 38ºC, prevents children from turning up the temperature, and the EcoButton allows you to reduce water usage by up to 50%. - GROHE TurboStat® compact cartridge with wax thermoelement: Thermostatic temperature stability keeps showering safe for all the family, regardless of any changes in the water supply. 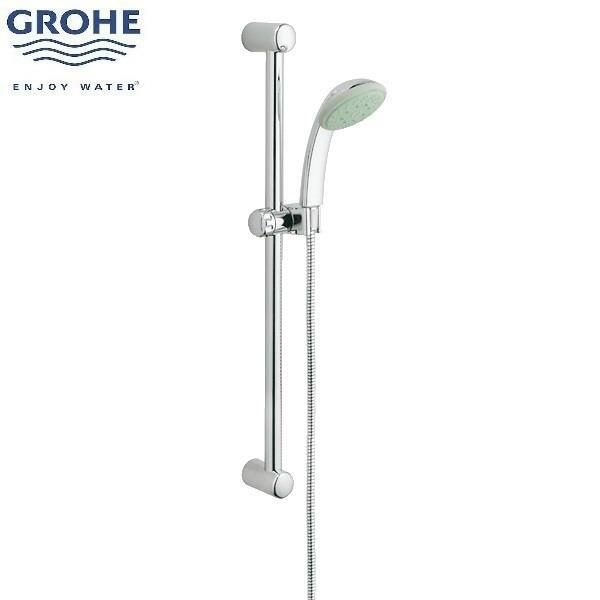 - GROHE SafeStop safety button at 38°C. 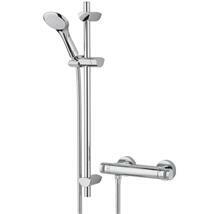 - GROHE StarLight® chrome finish: Resistant to scratches and tarnishing. 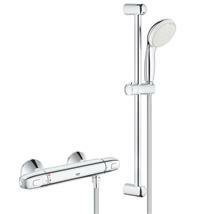 - Separate control handles for flow and temperature adjustment: Volume (flow adjustment) handle with economy EcoButton; Temperature handle with SafeStop safety button; EasyLogic scale ring. 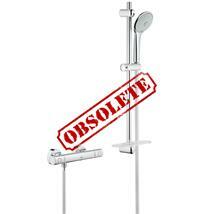 - Integrated mixed water shut off above. 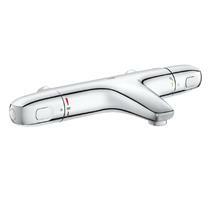 - Carbodur Ceramic headpart: 1/2'', 180°. 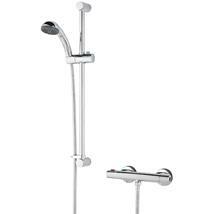 - Shower bottom outlet 1/2''. 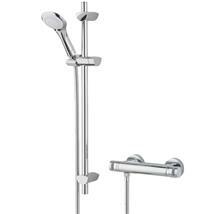 - Built-in non-return valves, dirt strainers. covered S-unions. 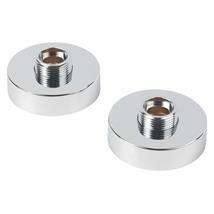 - Metal escutcheons Ø70mm, protected against backflow. 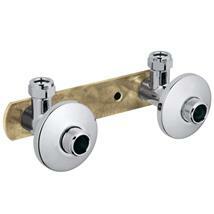 - Wall mounted installation: Engineered to make installation quick and easy. 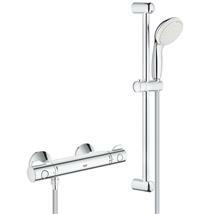 - Recommended flow pressure, Min/Max: 1 - 5 bar (pressure differential 5:1). - Recommended application: Domestic, high pressure systems. 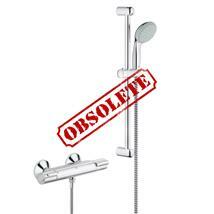 - 5 years GROHE Manufacturer's Guarantee. • GROHE DreamSpray® technology: Water is always evenly distributed to every single nozzle. • GROHE SpeedClean® nozzles preventing limescale build-up. 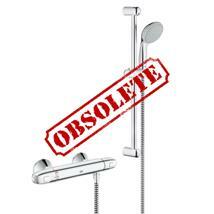 • GROHE CoolTouch® meaning it's never too hot to handle. 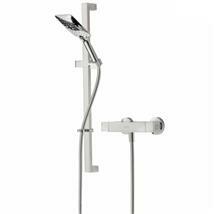 • 3 spray patterns: Rain/Needle Jet/Massage. • Protective high impact silicone ring: Anti-shock ring surrounds the spray face bringing an added level of robustness to the design. • Connection: 1/2'' male thread. 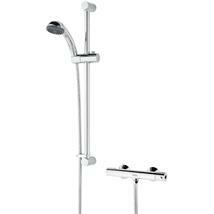 - Shower Rail: 600mm with wall holders, contains glide element and swivel holder. 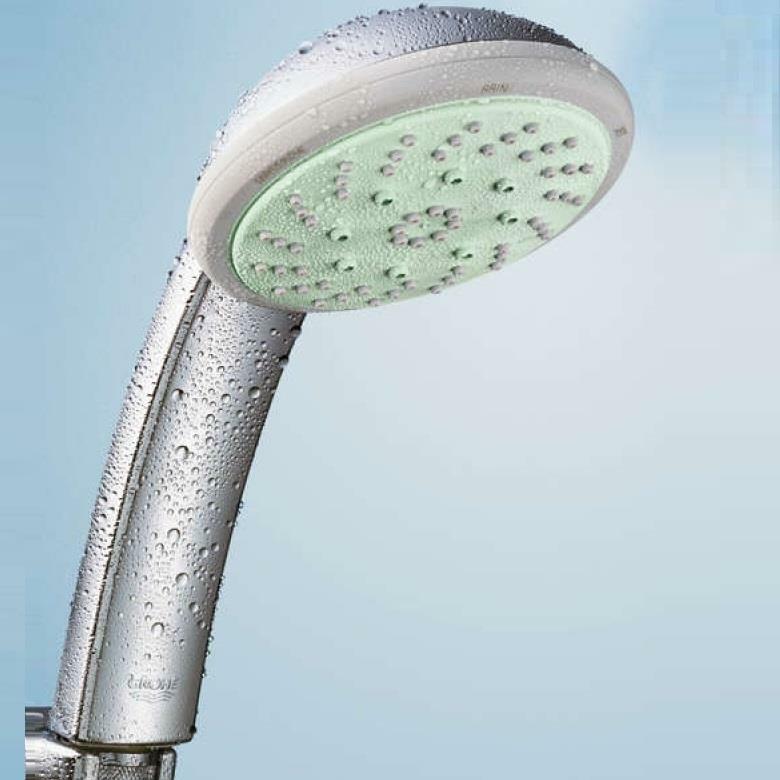 - Relexaflex Shower Hose: 1,500mm, 1/2'' x 1/2'' x 12mm bore. 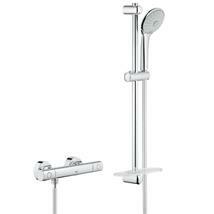 - Relexa Plus Shower Outlet Elbow: 1/2'', male thread, Ø67mm round metal escutcheon. - Min. recommended pressure: 1.0 bar. 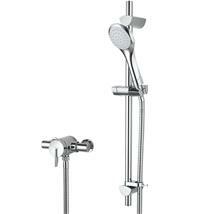 - Application: Domestic high pressure systems. 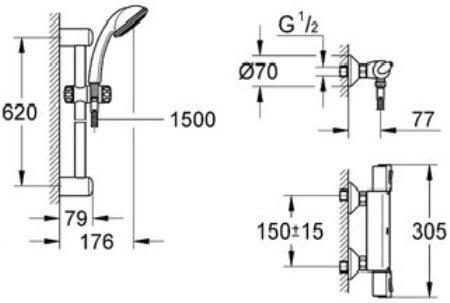 - Dimensions, mm: Please see pictures.